In my previous post I discussed the EPA’s Toxics Release Inventory, and provided a chart showing the total amount of toxic materials released in Missouri for the years 2002-2012. Toxic materials can be released into the air, they can be discharged into surface water, they can be held in impoundments, they can be injected into wells, and they can be landfilled or spread on the land. 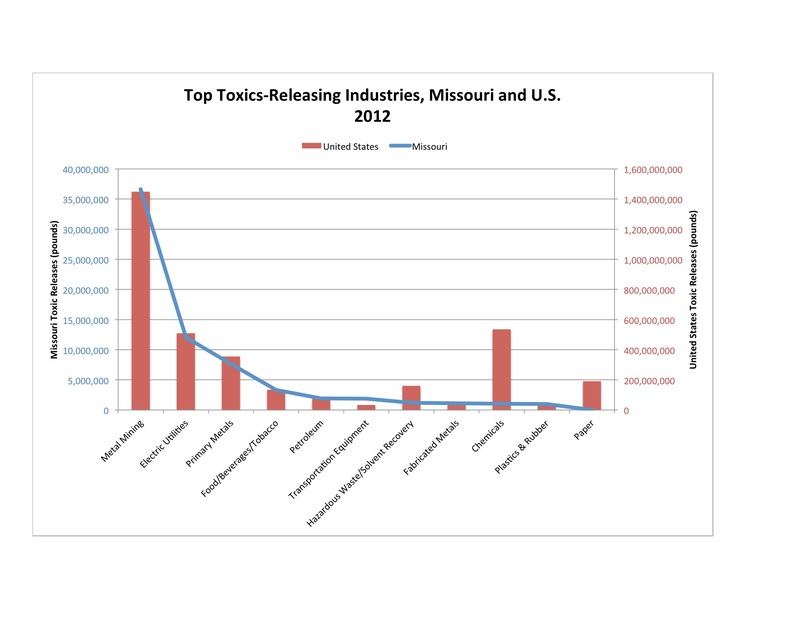 The first chart at right shows Missouri toxic releases by category in 2012. The vast amount of releases occur at the site where the toxics are generated (vs. being transported off-site for disposal). Almost 2/3 of the releases involve release into an impoundment of one sort or another. The next largest amount involves emission into the air. Toxics can also be managed by recycling, by energy recovery, by treatment, or by other methods. The second chart at right shows Missouri managed toxic wastes in 2012. The largest amount is recycled for reuse. The next largest amount is treated to make it less toxic. 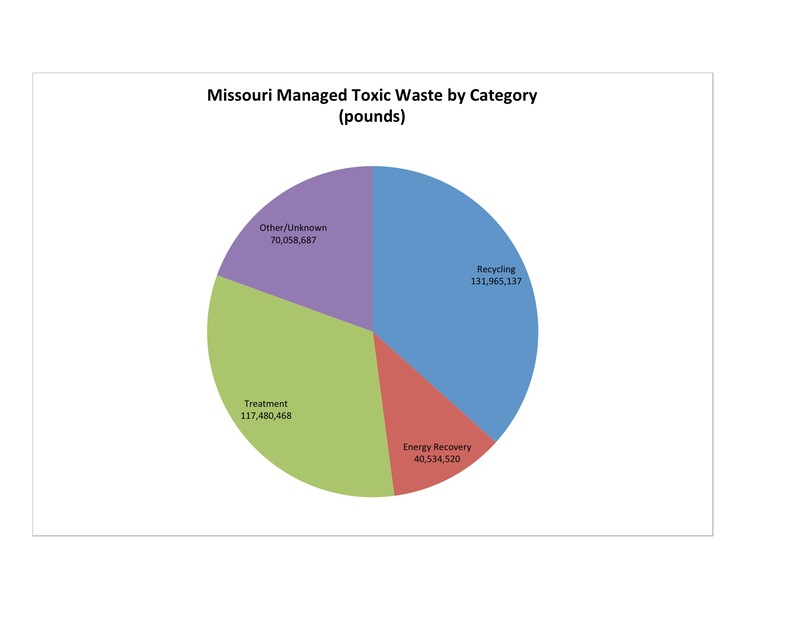 The total amount of managed toxic waste in Missouri in 2012 was 360 million pounds. The total amount of toxic releases were 70 million pounds. 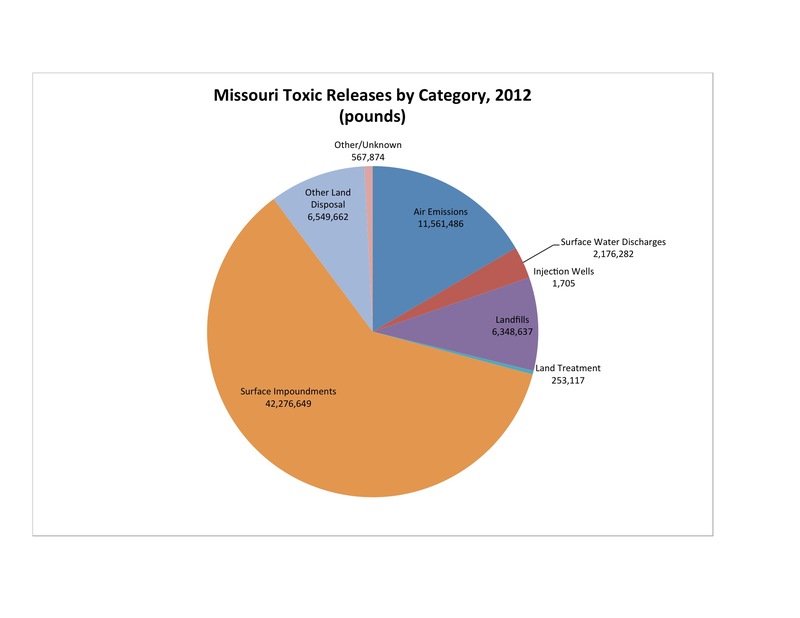 Thus, about 84% of Missouri toxics were managed in some fashion in 2012, while 16% were released. Nationally, about 23.5 billion pounds of toxic waste were managed in 2012 (87% of the total) , while 3.6 billion pounds were released (13% of the total). The industries responsible for releasing the largest amounts of toxic chemicals are shown in the third chart. Releases in Missouri are shown as the blue line and should be read on the left vertical axis. Releases in the United States are shown as red bars, and should be read on the right vertical axis. Metal mining is the largest, both in Missouri and nationwide, with more than double the releases of the next largest releasing industry. In Missouri, electric utilities are second, but nationwide it is the chemicals industry. I was surprised to see how much toxic material was released by the food, beverage, and tobacco industry. That it releases more than the petroleum and the plastics & rubber industries blows my mind! 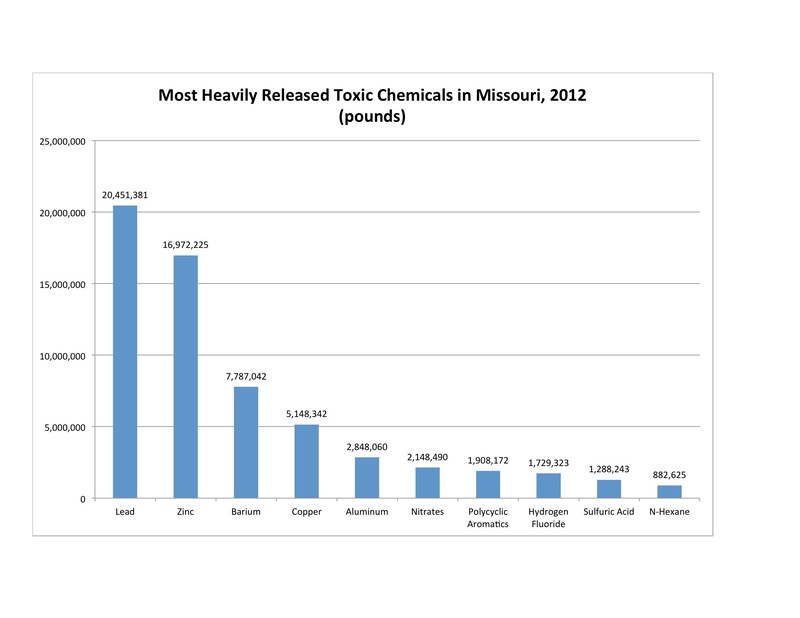 The top 10 toxic chemicals released in Missouri in 2012 are shown in the third chart at right. The top five are all associated with the metal mining industry. Chemicals that are persistent, bioaccumulative, and toxic (PBT) are of most concern to the EPA. Lead accounts for 98% of PBT releases nationwide. Lead emissions are driven by mining activities, and more lead was released in Missouri in 2012 than any other toxic compound. Mercury is also a PBT of concern. Coal burning power plants are the largest source of mercury emissions in the United States. Nationwide, mercury emissions have been falling, from over 140,000 lb. in 2004 to under 80,000 in 2012. It was the 57th most heavily released chemical in Missouri in 2012. Information about all these chemicals can be found on the EPA website or on Wikipedia. Environmental Protection Agency. 2014. 2012 Toxics Release Inventory National Analysis Overview. http://www2.epa.gov/toxics-release-inventory-tri-program/2012-tri-national-analysis. Information on specific industries and specific chemicals releases came from the EPA TRI Explorer data portal. The data was viewed 3/13/14 at http://iaspub.epa.gov/triexplorer/tri_release.chemical. By mogreenstats in Air, Land, Pollution - Land, Water, Water Pollution on 2014/06/12 .